I hope you’ll find today’s post as interesting as I do. It’s a bit of brain candy and outlines an exciting vision for the future of digital identities. Over the last 12 months we’ve invested in incubating a set of ideas for using Blockchain (and other distributed ledger technologies) to create new types of digital identities, identities designed from the ground up to enhance personal privacy, security and control. We’re pretty excited by what we’ve learned and by the new partnerships we’ve formed in the process. Today we’re taking the opportunity to share our thinking and direction with you. This blog is part of a series and follows on Peggy Johnson’s blog post announcing that Microsoft has joined the ID2020 initiative. If you haven’t already Peggy’s post, I would recommend reading it first. I’ve asked Ankur Patel, the PM on my team leading these incubations to kick our discussion on Decentralized Digital Identities off for us. His post focuses on sharing some of the core things we’ve learned and some of the resulting principles we’re using to drive our investments in this area going forward. And as always, we’d love to hear your thoughts and feedback. Greetings everyone, I’m Ankur Patel from Microsoft’s Identity Division. It is an awesome privilege to have this opportunity to share some of our learnings and future directions based on our efforts to incubate Blockchain/distributed ledger based Decentralized Identities. 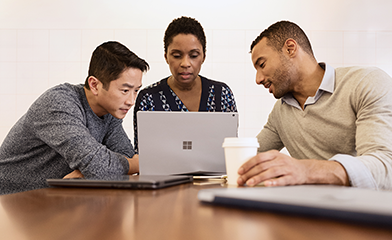 Microsoft’s cloud identity systems already empower thousands of developers, organizations and billions of people to work, play, and achieve more. And yet there is so much more we can do to empower everyone. We aspire to a world where the billions of people living today with no reliable ID can finally realize the dreams we all share like educating our children, improving our quality of life, or starting a business. To achieve this vision, we believe it is essential for individuals to own and control all elements of their digital identity. Rather than grant broad consent to countless apps and services, and have their identity data spread across numerous providers, individuals need a secure encrypted digital hub where they can store their identity data and easily control access to it. We know that enabling this kind of self-sovereign digital identity is bigger than any one company or organization. We’re committed to working closely with our customers, partners and the community to unlock the next generation of digital identity-based experiences and we’re excited to partner with so many people in the industry who are making incredible contributions to this space. To that end today we are sharing our best thinking based on what we’ve learned from our decentralized identity incubation, an effort which is aimed at enabling richer experiences, enhancing trust, and reducing friction, while empowering every person to own and control their Digital Identity. Own and control your Identity. Today, users grant broad consent to countless apps and services for collection, use and retention beyond their control. With data breaches and identity theft becoming more sophisticated and frequent, users need a way to take ownership of their identity. After examining decentralized storage systems, consensus protocols, blockchains, and a variety of emerging standards we believe blockchain technology and protocols are well suited for enabling Decentralized IDs (DID). Privacy by design, built in from the ground up. Today, apps, services, and organizations deliver convenient, predictable, tailored experiences that depend on control of identity-bound data. We need a secure encrypted digital hub (ID Hubs) that can interact with user’s data while honoring user privacy and control. Trust is earned by individuals, built by the community. Traditional identity systems are mostly geared toward authentication and access management. A self-owned identity system adds a focus on authenticity and how community can establish trust. In a decentralized system trust is based on attestations: claims that other entities endorse – which helps prove facets of one’s identity. Apps and services built with the user at the center. Some of the most engaging apps and services today are ones that offer experiences personalized for their users by gaining access to their user’s Personally Identifiable Information (PII). DIDs and ID Hubs can enable developers to gain access to a more precise set of attestations while reducing legal and compliance risks by processing such information, instead of controlling it on behalf of the user. Identity Hubs – an encrypted identity datastore that features message/intent relay, attestation handling, and identity-specific compute endpoints. Verifiable Credentials – a W3C spec that defines a document format for encoding DID-based attestations. To support a vast world of users, organizations, and devices, the underlying technology must be capable of scale and performance on par with traditional systems. Some public blockchains (Bitcoin [BTC], Ethereum, Litecoin, to name a select few) provide a solid foundation for rooting DIDs, recording DPKI operations, and anchoring attestations. While some blockchain communities have increased on-chain transaction capacity (e.g. blocksize increases), this approach generally degrades the decentralized state of the network and cannot reach the millions of transactions per second the system would generate at world-scale. To overcome these technical barriers, we are collaborating on decentralized Layer 2 protocols that run atop these public blockchains to achieve global scale, while preserving the attributes of a world class DID system. The blockchain ecosystem today is still mostly early adopters who are willing to spend time, effort, and energy managing keys and securing devices. This is not something we can expect mainstream people to deal with. We need to make key management challenges, such as recovery, rotation, and secure access, intuitive and fool-proof. New systems and big ideas, often make sense on a whiteboard. All the lines connect, and assumptions seem solid. However, product and engineering teams learn the most by shipping. Today, the Microsoft Authenticator app is already used by millions of people to prove their identity every day. As a next step we will experiment with Decentralized Identities by adding support for them into to Microsoft Authenticator. With consent, Microsoft Authenticator will be able to act as your User Agent to manage identity data and cryptographic keys. In this design, only the ID is rooted on chain. Identity data is stored in an off-chain ID Hub (that Microsoft can’t see) encrypted using these cryptographic keys. Once we have added this capability, apps and services will be able to interact with user’s data using a common messaging conduit by requesting granular consent. Initially we will support a select group of DID implementations across blockchains and we will likely add more in the future. We are humbled and excited to take on such a massive challenge, but also know it can’t be accomplished alone. We are counting on the support and input of our alliance partners, members of the Decentralized Identity Foundation, and the diverse Microsoft ecosystem of designers, policy makers, business partners, hardware and software builders. Most importantly we will need you, our customers to provide feedback as we start testing these first set of scenarios. This is our first post about our work on Decentralized Identity. In upcoming posts we will share information about our proofs of concept as well as technical details for key areas outlined above. We look forward to you joining us on this venture!